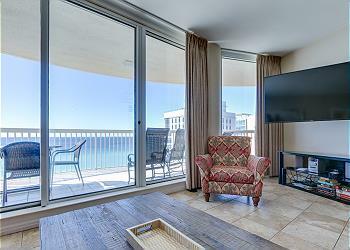 Silver Shells Beach Resort & Spa located in the heart of Destin, Florida. The St. Maarten building is a beachfront building inside the resort that shares in Gulf views, a fabulous pool (one of the best in Destin! ), and an easy walk down to the beach where you'll find chair rentals, a beach bar & food, and the endless miles of white beaches. Our three bedroom condos provide your family with enough space and the essentials needed to start off your vacation just right. Enjoy huge, private balconies where you can relax each morning with a hot cup of coffee and watch the dolphins play or look to your right for fun views of Destin: Big Kahunas waterpark, The Track family amusement park, and more. Later on in the morning, stop by the gorgeous pool area and catch some much needed rays and Vitamin C. For those beach lovers we know, take a quick stroll down to your beach access point and don't forget to grab a cool, refreshing beverage from the beach bar. Covered parking, free wifi, Ruth Chris steakhouse on-site and more are included with your stay making your vacation at St. Maarten a memory worth sharing!